Soaps are molecules in which the two ends have differing properties, one is hydrophilic, that is, it dissolves in water, while the other end is hydrophobic, that is, it dissolves in hydrocarbons. When soap is at the surface of water, the hydrophobic tail of soap will not be soluble in water and the soap will align along the surface of water with the ionic end in water and hydrocarbon tail protruding out of water. Inside the water, these molecules have a unique orientation that keeps the hydrocarbon portion out of the water. This is accomplished by forming clusters of molecules in which the hydrophobic tails are in the interior of the cluster and the ionic ends are on the surface. This formation is called micelle. Soap in the form of a micelle is able to clean, since the oily dirt will be collected in the centre of micelle. a measuring scale and three droppers. As the calcium and magnesium salts in water react with soap, cleansing power of soap is reduced and its foaming capacity also decreases. 2. Prepare 30 ml soap solution by adding 1 g soap to water in beaker ‘C’. 3. Pour 20 ml tap water in beaker ‘A’ and 50 ml distilled water in beaker ‘B’. 4. 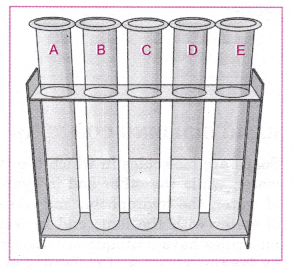 Place five test tubes, labelled A, B, C, D and E, in a test tube stand. 5. Using a dropper pour 5 ml of tap water in test tube A, and 5 ml distilled water in the other test tubes labelled as B, C, D and E.
6. To test tube C, D and E add a pinch of calcium hydrogencarbonate, calcium chloride and calcium sulphate respectively using a spatula. 7. Mix the solution well using a glass rod. 8. Using a dropper, add 3 ml of soap solution to the test tube A. Measure the length of the solution present in the test tube A and record this in table. 9. Shake test tube A, ten times by placing thumb on its mouth. 10. 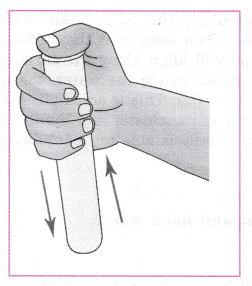 Observe whether foam is formed by shaking the test tube and record your observations. 11. Measure the length of content (foam and solution) present in the test tube immediately with the help of a measuring scale. 12. Repeat steps 8 to 11 with the remaining water samples (B, C, D and E) and record your observations. Volume of water samples taken in test tube = 5 ml. Volume of soap solution added to each test tube = 3 ml. The water sample most suitable for washing purpose is …………………………..
For cleaning, foam needs to be produced. Production of foam depends on the free availability of hydrophobic portion of the soap. In hard water due to formation of scum hydrophobic portion of the soap gets trapped. Therefore, hard water is not suitable for cleaning purpose. Use same amount of soap for all the samples. Take equal volumes of water samples. 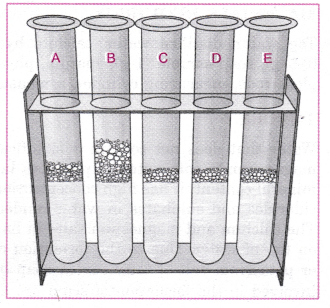 Shake each test tube equal number of times and in a similar manner. Length of foam should be measured immediately after shaking. Hard water is the water that has high mineral content and produces scum on addition of soap. The water which has low mineral content and produces lather on mixing soap to it is called soft water. Why does hard water produce scum when soap is added to it? Hard water produces scum when soap is added due to the presence of Ca2+ and Mg2+ salts in it, which react with soap forming precipitates which are calcium and magnesium salts of soap. How does presence of Ca2+ and Mg2+ ions in water lead to the formation of scum? Ca2+ and Mg2+ ions present in hard water react with soap to form calcium and magnesium salts of soap which are insoluble in water. Give the equation involved in the formation of scum. Does the presence of all salts of calcium and magnesium cause hardness in water? Which salts cause hardness in water? The hydrogencarbonates, chlorides and sulphates of calcium and magnesium cause hardness in water. Which ions are present in soft water? Only sodium ion is present in soft water. Which out of hard water or soft water is better for cleansing? By boiling or by chemical treatment. Can hard water be used for washing purposes? No, hard water cannot be used for washing purposes. Because a large amount of soap gets washed away due to the formation of scum. This also sticks to fibres of garments. Out of soaps and detergents which form lather in hard water? Would sodium chloride present in water render it hard? No, sodium chloride does not render water hard. Can you explain why sodium salts in water do not make it hard water? Soaps are sodium salts of fatty acids. On adding sodium salts to water containing soap, no scum is formed as can be understood by the following equation. Do both hard water and soft water produce foam with soap? No, only soft water produces foam with soap. Scum is formed when hard water is treated with soap because Ca2+, Mg2+ ions present in hard water react with soap and form an insoluble precipitate scum. With their prolong use, white scales get deposited in the interior of boilers and electric kettles. What is the reason for this observation? On prolong use, scales are deposited in the interior of boilers and electric kettles due to the precipitation of CaCO,, and CaS04. The precipitation of CaC03 is also caused due to the thermal decomposition of bicarbonate ions. Temporary hardness is caused due to the presence of calcium and magnesium bicarbonates in water and can be removed by boiling or by adding Na2C03 to hard water. Permanent hardness is caused due to the presence of chlorides and sulphates of calcium and magnesium and can be removed by using an ion exchanger. Presence of which salt makes the water hard? Which of the following statement is correct about the formation of lather by soap? (a) In hard water soap forms more lather. (b) In soft water soap forms more lather. (c) In both hard and soft water soap forms same amount of lather. (d) In both hard and soft water soap does not form lather. (d) chlorides and sulphates of magnesium and potassium. Which of the following is best suited for washing clothes with soap? Why can’t hard water be used for washing clothes? (a) It forms scum with soap. (b) It hardens the texture of clothes. (c) It does not react with soap. (d) This statement is wrong. Hard water is suited well for washing clothes. When hard water is used in boilers for a long time, which phenomenon is observed? (а) The amount of steam formed in boilers ; increases. (b) The boilers work more efficiently. (c) White scales get deposited on the interiors of boilers. (d) Boilers do not work with hard water. (a) hard water reacts with fibres of clothes. (b) the scum formed by reaction of soap with hard water sticks to the fibres of clothes. (c) hard water itself is dirty. (d) fibres of clothes do not get wetted by hard water so they do not get cleaned. (а) Soaps and detergents both form lather with soft water. (б) Soaps form lather with hard water, detergents do not form lather with hard water. (c) Soaps do not form lather with hard water, detergents form lather with hard water. (d) Detergents are better cleaning agents than soaps. (d) depends upon the quality of soap. Identify the statement which is not correct. (a) Soap forms micelles in soft water. (b) Soap forms scum in hard water. (c) Soap forms lather in soft water. (d) Both ends of a soap molecule are hydrophobic. (d) the foaming capacity decreases and then increases. 1.Differentiate between soft water and hard water. 2. Are soap molecules hydrophobic or hydrophilic in nature? 3. How is soap able to clean oily dirt? 4. Soap cannot be used in hard water. Why? 2. A soap molecule is made up of two parts: a long hydrocarbon part and a short ionic part. The long hydrocarbon chain is hydrophobic in nature but the ionic part is hydrophilic in nature. of micelle. Besides this, soap micelles can be easily rinsed away as they are present in the form of colloid. 4. Hard water contains Ca2+ and Mg2+ ions. When soap is added to hard water, Ca2+ and Mg2+ ions react with soap to form calcium and magnesium salts of soap. There salts of soap are insoluble in water and form scum. As a result, a lot of soap is wasted. Because of this reason soap cannot be used in hard water. Detergents can be used in hard water but soap cannot be used in hard water. Soaps are biodegradable and hence they do not cause pollution. Detergents are non-biodegradable and hence cause water pollution.